Expect a warm day Thursday across the Rio Grande Valley. The morning cloudy skies are expected to give way to mostly sunny skies by late morning or early afternoon. Highs will reach the mid to upper 80s. Some areas west of Highway 281 may be in the lower 90s. Rio Grande City is expected to reach 90. McAllen will be 89 and Brownsville 86. The coast will be cooler, as South Padre Island’s expected high will be 75. On Friday, temperatures will be similar to today’s. There is expected to be patchy fog in the morning and a 30 percent chance for thunderstorms overnight into Saturday. Above average temperatures are expected for the weekend. 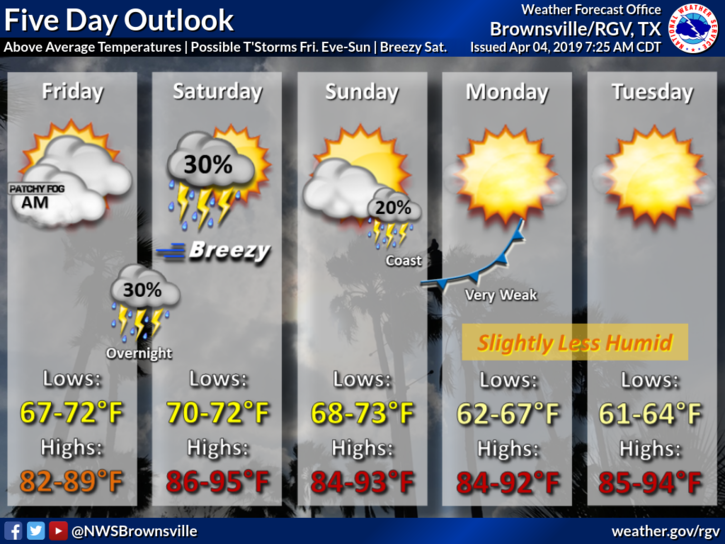 There will be a chance for thunderstorms through Sunday. A weak cold front will push through the Valley Monday morning. This cold front is not expected to cool temperatures down much. It will, however, dry the air slightly for Monday and Tuesday.